A father and several of his children are feared to have died in a house fire in Powys. Three children, aged 10, 12 and 13, escaped the blaze near Llangammarch Wells just after midnight on Monday and are being treated in hospital. One of the people unaccounted for has been named locally as David Cuthbertson. Police confirmed people were missing and some had died in the fire, adding the cause was unexplained. Ron Birchall, 73, who lives at the former Aberceiros Inn in the village, described Mr Cuthbertson as “a great guy”. He added: “All I can say is that he was a great father who loved his kids and doted on them. A joint police and fire service statement said the children who escaped had non life-threatening injuries. It continued: “Due to the severity of damage at the scene we are unable at this stage to identify any of the deceased or confirm numbers. Mid and West Wales Fire and Rescue Service said its crews were faced with an “extremely difficult situation” at the scene and firefighters did all they could to handle the situation. 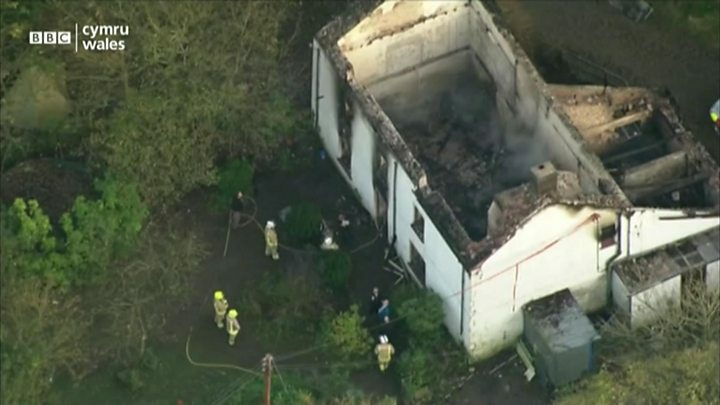 Ch Insp Martin Slevin, of Dyfed-Powys Police, told a press conference the investigation into the fire and the recovery of the victims’ bodies would be difficult. He described the scene as “chaotic” with “significant” damage to the structure of the building, but said officers would work to provide answers about the cause of the blaze. Powys councillor Tim Van-Rees, who represents the Llanwrtyd Wells area and who knew the family who lived at the property, described the incident as “devastating”. He said: “It is absolutely shocking and a devastating blow and it is possibly just as well we are in half-term at the moment because the effect on our children and the schools would have been very severe. “I have spoken to the owner of the property who was alerted and telephoned the fire brigade and I must say as a member of the fire authority the local fire brigade were outstanding. He said firefighters “risked life and limb” to see whether anything could be done but “unfortunately their efforts were not well rewarded”. Chris Davies MP wrote on his Facebook page: “My thoughts are with those affected by the reported fire in Llangammarch. A number of ambulances were sent to the house, while 20 members of Brecon Mountain Rescue Team helped search the surrounding area for casualties. Llangammarch Wells is the smallest of the four spa villages and towns of mid Wales, the others being Llandrindod Wells, Builth Wells and Llanwrtyd Wells. It lies on the River Irfon and has a population of just under 500 people.